Uploaded 5/27/2010 Film / Memory Type . This landscape is fabulous ! It seems quite intriguing to me that there is no foot-path between you and the other character. Very good pov ! 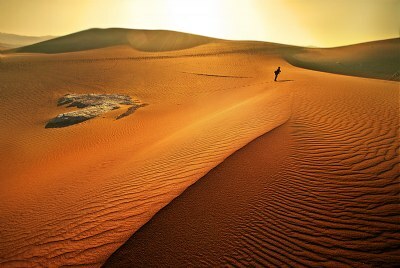 It seems you have done a fantastic travel and took some amazing photos in desert! Yes Jan, I have noticed that, and is one area of concern for me. Thanks for pointing it out ! A wonderful composition full of curves and colors, light and some shadows! one only remark maybe: somewhat less sharpness on the sides, especially the right one? I just moved my house and am completely sore from it. will write to you shortly.. Very nice composition and excellent lighting and colour, Avi! I like the line of the dune leading to the solitary person. hi dear avi! great light in this shot! vignetting jinishta amar ashole bhaloi lage. ar hyan, saturation tao ektu pump korechhi.. tobe not sure.. komiyeo dewa-i jaay. tobe toke clone korbo na konomotei.. shudhu pose ta falling na hoye upright hole best hoto ei ja.. Wonderful image and colors, the human presence let me see the greatness of this place. Lovely comp,fantastic colors and texture.I love the absence of any marks on the virgin sands except his foot prints. Maybe. To me, photography is an art, not a science. Tai shobkichhu perfect howar dorkar nei. If a photograph can appeal to me emotively, it has succeeded for me. Sir er shei bikhyato jol-er opor diye lafanor chhobita khutiye dekh.. onek 'khut' khuje paabi..
Avi da je chhobir reference dile, asombhob bhalo chhobi. ami agei dekehci. kintu chhobitay haat r payer skin-ta ektu gorbor koreche na? Ha ha.. good call. Now I see it too. I think that the sun was more slanting, as we can see the way the shadow of the dune right in the foreground is created (also falling away to the right). I guess the flair going the other way is kind of misleading the eyes. Posture - agreed. that is the only thing I didn't like in the shot. He was climbing that small dune in front of him.. timing-e about 1 second er gorbor hoyechhe ar ki. Really... excellent work my friend. i'm confused: how is it the shadow of the figure runs perpendicular to the sun???? bhalo processing. flair ta o tomaar for a geche. Besh kichudin dhore I am feeling against the sun light onek interesting perspective and mood of light pawa jaay rather then putting sun on your back. Anindya r posture ta bhalo laaglo na. shoja hoye dariye thakle othoba pechon phire haantle onek beshi monograhi hoto. Absolutely fantastic shot; how great colors!!! Wow excellent my friend . wonderful dear Avi,colors,light and the whole composition. it is my first time to notice your 5D gear,congrats for the best ever so widely existed camera. the shot is made by you. Ashadharon chobi. kono kotha hobe na. Good to see again after a long while,Avi!